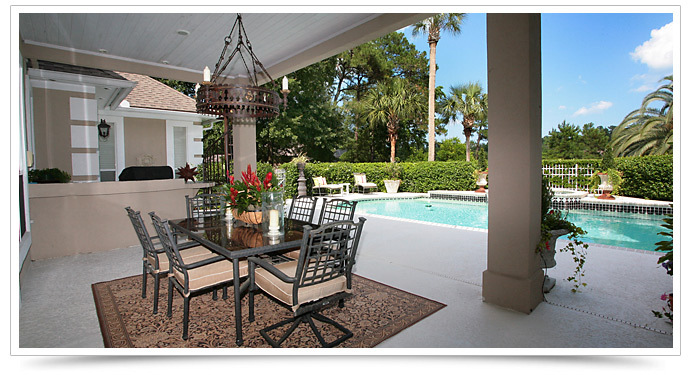 WaterShed UnderDeck Systems transforms the space under your deck into an attractive, usable, living area while adding style, value and a beautiful living area to your home. Underdecking adds a clean look that will brighten the ceiling and area under your deck. Water and other liquids from the upper deck are diverted into our aluminum gutters and quickly sent on their way. Seamless gutters and downspouts can be used to quickly direct liquids away from your home. Our UnderDeck systems are maintenance free. Once we install this system it is ready to use. 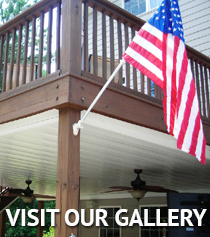 Our worry-free materials won’t react adversely to pressure treating materials you may choose to use on your deck. Painting your deck is also possible with this system in place. Our system is made of large aluminum panels that interlock together.This makes it possible for recessed lighting and ceiling fans. Our material is coated with a scratch resistant coating that protects the aluminum ceiling for years to come. Under deck waterproofing ceiling systems, make it possible to use the space under your deck while keeping water away from your home.